This Mason Jar Glass Mug is our most popular selling glassware with reason. Applications do include company, organization, special event celebrations. 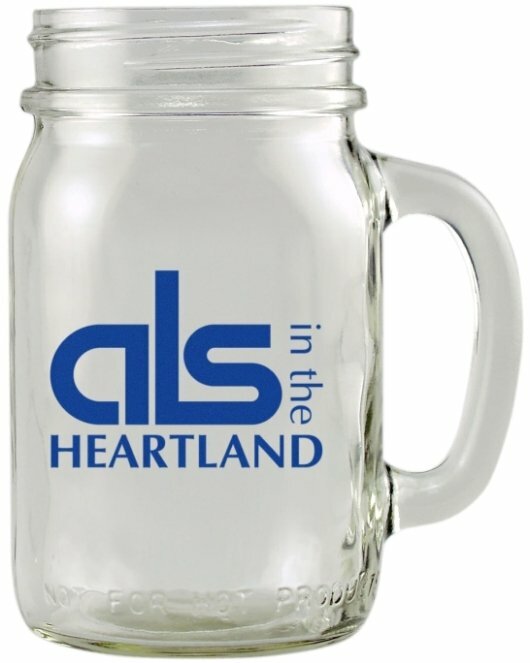 Glass mug features include clear medium wt. glass, large sturdy handle. This glassware has a 16 oz. capacity. Size 5 h x 2 1/2 top x 2 1/2 bott. For bulk solid or slotted white plastic screw on lids add $.45 each. You MUST order this glassware in whole cartons of 36 units. SafePack Cartons required add $7.00 per carton. Delivery from date of an order is 3-4 weeks. Use of cold beverages only is recommended. This Glassware is Made in the USA. Price includes one std. color imprint on two sides area 2 1/4" w x 2 3/8" h.
Clear glass imprint provides the best presentation on one side. Close registration-overlapping colors is much more. One color imprint is recommended for economy. Logos do require Illustrator ai, eps or pdf art.